When Elon Musk launched the Tesla Model S sedan not only was it a car built from the ground up with all sorts of new technology (or at very least it was a uniquely compiled set of existing technology), but also it was a car delivered to consumers in an entirely new business model that did away with the archaic car dealer middle man. Since it’s launch in 2012 the Model S has cemented Tesla as an innovation powerhouse. In Tesla’s case the primary new technology runway they have going for them is the rapid decline in the cost of lithium battery technology. 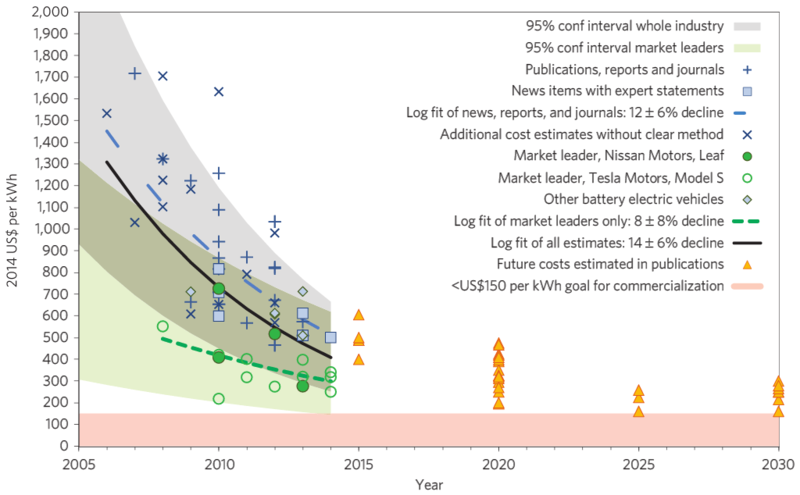 In a study by Nature Climate Change they reported that the cost of lithium battery storage technology has declined precipitously over the last decade and will likely continue to decline as additional production scale comes online such as the Tesla Gigafactory in Nevada. The next several paragraphs are a deep numbers dive into the dramatic drop in prices of lithium batteries. If you are one who gets bored by numbers easily, feel free to skip this portion! In 2008 the median $/kwh cost for a lithium ion battery was roughly $1000. That was the same year Tesla launched the Roadster at a base price of $110,000. At the time the roadster sported a 57kwh battery. The chart below shows Tesla as the battery cost market leader at around $560/kwh. It’s no stretch to conclude that the battery alone in the Tesla Roadster may well have cost $32,000 – nearly a third of the overall purchase price of the car. According to news reports replacement batteries for the Tesla Roadster cost $40,000 in 2012. This number makes sense since Tesla would make roughly $8,000 on a replacement battery at a gross profit margin of 20%. Fast forward to 2012 and the median $/kwh cost for a lithium ion battery has dropped almost in half to roughly $550/kwh. That same year the Model S launched at a base price of $80,000 equipped with an 85kwh battery. If the chart is correct, the Model S battery costs were also market leading at roughly $325/kwh. This suggests the battery in the first 85kwh Model S would have cost roughly $28,000. According to Wikipedia, after the 8th year of ownership a replacement 85kwh battery will cost $12,000. If we assume Tesla is making the same 20% GP, $2,400 in this case, on that replacement battery as they did on the Roadster replacement battery then we can conclude that Tesla expects that by the year 2020 their costs for the 85kwh battery will be roughly $9,600 or $113/kwh. Even the predictions below don’t ever get that low. But perhaps the Gigafactory will enable them to achieve it. Either way the point is to illustrate that thanks to lithium ion battery technology advancements, over the relatively short span of roughly 15 years the costs of producing lithium batteries will have reduced by a factor of 10. That’s the kind of technology progression that can lead to a transformational change. Another data point to note is the Tesla Powerwall which is designed to allow storage of solar energy for homes in order to reduce reliance on the grid. According to Tesla’s website the Powerwall will launch with a 10kwh model for $3,500 and a 7kwh model for $3,000. Taking the 10kwh model as an example, it assumes a price/kwh of $350. This is right in line when considering the lowest reported Model S battery cost to Tesla is roughly $270/kwh in 2014. If they make $70/kwh on the 10kwh battery that’s also a 20% gross profit margin. However with the 7kwh battery, at a price of $429/kwh, assuming the same costs of $270/kwh, their GP is a healthy 37%. If their cost reductions come in according to plan, the price to homeowners of the 10kwh powerwall could get as low as $1,500. One thing to note is that these costs are one-time manufacturing costs and not to be compared with the price/kwh of the utility bill. To do those calculations we need to estimate the total number of khw the battery will provide over it’s life. According to Tesla’s website the batteries are rated for 10 year life. Quick math suggests that if the Powerwall is used every day at full capacity for 10 years then it would produce roughly 36,000 kwh’s. In today’s cost of $3,500 that comes out to a $/kwh cost of $0.095/kwh – even lower than most utility bills in America. However that’s just paying for the power coming out of the battery. You still had to pay for the power to go in using solar at roughly $0.14/kwh. So total $/kwh in todays costs are roughly $0.23/kwh. However in the scaled example the economics become much better. If the 10kwh battery costs homeowners $1,500 and produces 36,000 kwh’s over it’s life then the cost per kwh is $0.04/kwh. Added to solar’s already roughly $0.14/kwh and the total is roughly $0.18/kwh – pretty reasonable cost for going off the grid. Solar itself is another great example of a technology runway. The prices above are really just related to recent years. 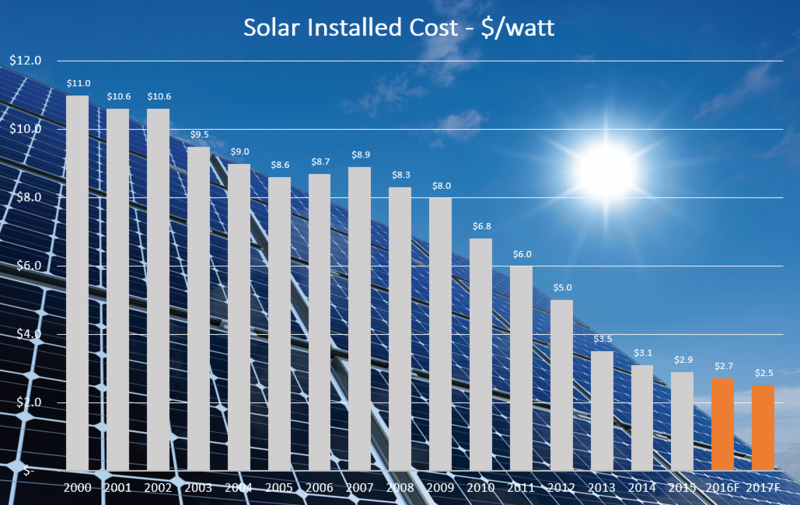 Over the last 15 years though, solar has experienced a dramatic decline in cost as well. From the above data it’s clear that when SolarCity was founded in 2006, the runway left for solar was substantial. 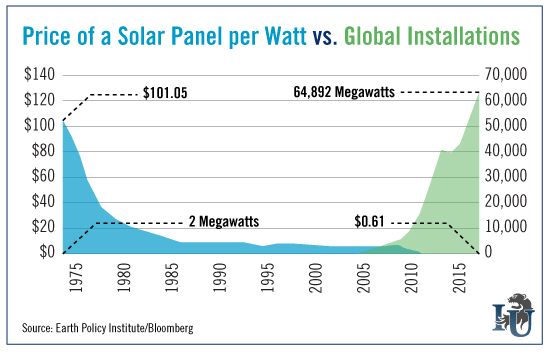 With the benefit of scale, solar costs have reduced nearly four fold since 2000. If you view the data back far enough that number easily becomes on the order of 10X. Suppose you were thinking about the runway for solar and you were in the year 1983. From that year’s perspective, assuming you couldn’t know anything after 1983, you could reasonably conclude that the cost of solar panels would continue to decline over time. That’s a simple way to analyze the trend. But what if you were in the year 1991 and you saw that the cost of panels has started to go back up a little. Based on the data you would have in 1991, you might conclude that the cost runway has run it’s course. This is where simple trend analysis alone breaks down and its important to consider other factors. In some cases, such as semiconductors and solar photovoltaics, an expert in the field will have proclaimed a law that summarizes the economic runway for that particular technology. In the case of semiconductors that law is Moore’s law after Gordon Moore, a founder of Intel and prominent engineer in the field. His observation states that the performance of integrated circuits doubles every year (by doubling the number of transistors per square inch) and will continue for the foreseeable future. Since he made that observation in 1965, the performance of circuits has for the most part followed that curve. In the case of solar, Swanson’s Law, after SunPower co-founder Richard Swanson, illustrated that the price of solar PV panels drops by roughly 20% for every doubling of cumulative shipped volume. 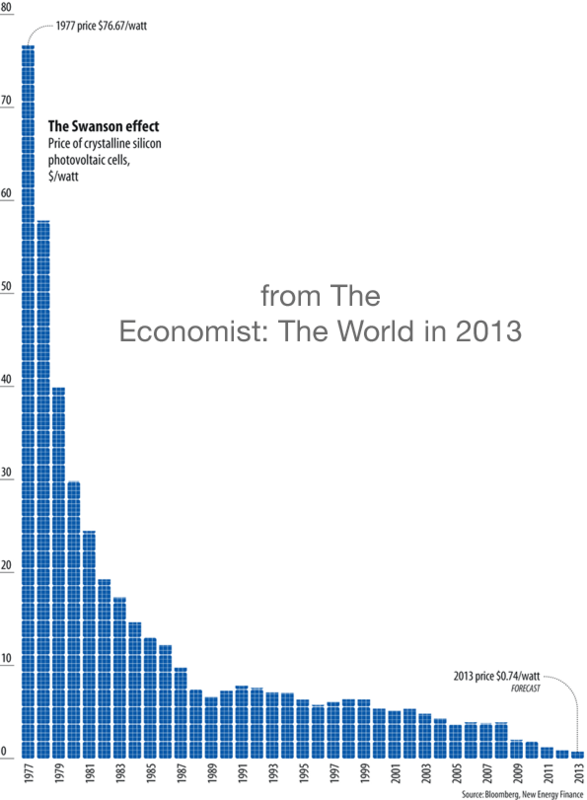 This rule of thumb has roughly defined the economics of solar panels since the 80’s. The below chart illustrates this impact of scaling well. Laws of credible experts are more of a luxury than a norm. Given this, how can we determine if there is still runway in a technology without such declared “laws?” Because even if the technology you are analyzing does have a credible law associated with it, at some point that law will fizzle out. One way to know if the technology has run its course is to analyze its production volume relative to the possible total market you envision it could have. In the case of solar, from SolarCity’s standpoint the total available market could be every home in America having rooftop solar. It could even be much bigger than that if you include commercial buildings and utilities. Knowing the size of the market relative to the current market penetration can help you determine if the technology you’re analyzing still has room for substantial improvement. Given solar’s limited market share, additional scale could benefit solar for years into the future. In the software world the same rule applies but the advantage to software, which is why it has and will continue to enjoy an almost limitless runway, is that bits are practically free and the cost of rearranging bits are significantly lower than the cost of rearranging atoms. If we wanted to know the cost floor on solar panel technology all we would need to do is weigh the components and multiply each weight by the spot price of each component. After summing those numbers you would basically arrive at an estimate of the cost of the atoms involved. The next step then would be to apply an estimate for the cost of re-arranging those atoms into the form factor of a finished solar system. This process can be tricky depending on the complexity involved in manufacturing but a good starting point is to assume that re-arranging those atoms will cost roughly 1X the cost of the atoms themselves. So if the total cost of atoms going into a solar panel were $100 then we could assume that the cost to re-arrange those atoms into actual solar panels was $100 bringing the total to $200. The benefit of doing this analysis is when comparing your cost floor with the current costs available in the market. If there’s a significant difference, say 10X or $1400, then you could have a nice long technology runway ahead with cost reductions. A 10X improvement at scale is a good rough estimate of how to tell if your runway is long enough for transformational progress. The next important aspect of transformational innovation is a runway provided by new business models. 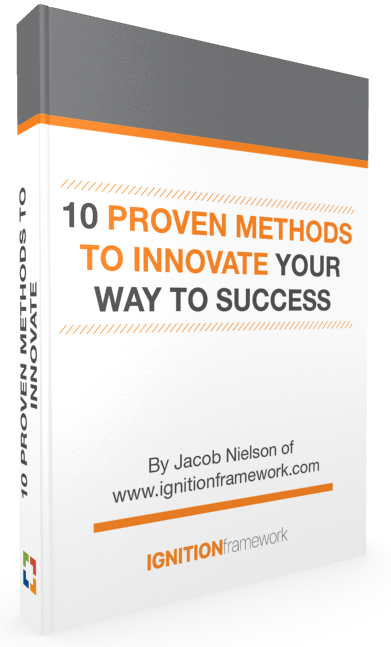 New business models are important because they improve the desirability, accessibility and convenience of getting a new idea to the target customer. For example, in SolarCity’s case even though they had a good technology runway in front of them they still needed a new business model to help consumers adopt the technology. At issue was the high cost of solar panels that most consumers couldn’t afford even if over the long term the investment made sense. To address this issue SolarCity pioneered two alternative methods of purchasing solar systems 1) Solar Leases and 2) Power Purchase Agreements (or PPA’s). The benefit these provided to consumers was avoiding the high up-front cost of solar systems and immediately enjoying the cost savings thanks to long-term financing that was bundled into the agreements. Without this new business model runway, SolarCity would not have achieved significant results in selling solar systems. Another example is Tesla’s strategy of using direct to consumer stores. The traditional auto industry sells cars through a dealer network where third parties establish large store fronts with a massive buildup of car inventory to sell in their local area. In contrast, Tesla puts up a much smaller, less expensive storefront in malls or other high traffic areas where there is no on-site inventory (cars on display are showroom only) and all orders are processed online. Face to face customer interactions. Because the sales force at Tesla stores are Tesla employees, feedback from consumers can be much more easily funneled to the engineering and design team at Tesla. This is a stark contrast to the two step feedback that occurs in the traditional auto industry where customers give their feedback to third parties who may or may not pass it along to the manufacturers. Substantially lower supply chain costs. The direct sales model eliminates the markup from wholesalers and dealers and substantially reduces the amount of inventory needed. Additionally the complexity of managing order flow from customers to manufacturers and back is substantially reduced thanks to the direct sales model. Another example of this was the invention of the iPhone by Apple in 2007. Most phones at the time were purchased through wireless carrier stores where the carriers controlled the customer sale and service experience. Apple was fed up with this approach and created a new way: direct to consumer sales through Apple stores and activation of the devices through Apple’s iTunes software. In the beginning stages of the iPhone, only this direct to consumer business model could ensure Apple’s tight control over the customer experience – something not to be polluted by third-party carriers. One reason these business models are growing is because in many ways they provide the consumer with a 10X improvement in their experience. If you’ve ever hailed a cab the old way and tried Uber as well, you know what I’m talking about. As you think about your next big idea be sure to analyze it in terms of both technology runway and business model runway. 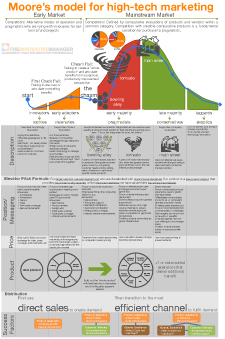 If you are confident the idea could achieve a 10X improvement in technology cost or performance and/or you think wrapping it in a new business model could provide a 10X improvement in customer experience then you probably have a massively successful idea in the making! 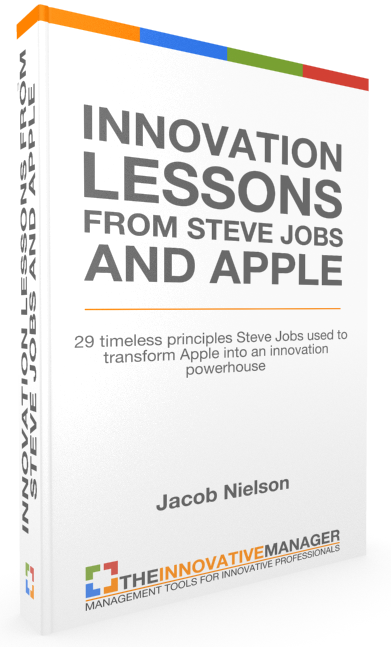 2 Responses to "The Two Enabling Forces of Innovation: New Technologies and New Business Models"
Excellent article. Being in the S/C business for decades, I completely agree with this article.Congratulations Jake!